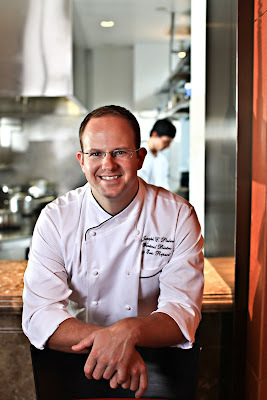 Joe Palma, chef de cuisine at Westend Bistro by Eric Ripert, first got cooking while he was at the College of Charleston. He got a job as a line cook for Charleston chef Frank Lee at Slightly North of Broad and fell in love with French bistro cuisine and Southern flavors. He went on to work at Citronelle and Le Paradou and, in 2006, joined Ripert’s team at Le Bernardin. Palma was tapped by Ripert in 2008 to head the kitchen at Westend. Love Westend! So nice to read about the chef. This feature rocks.